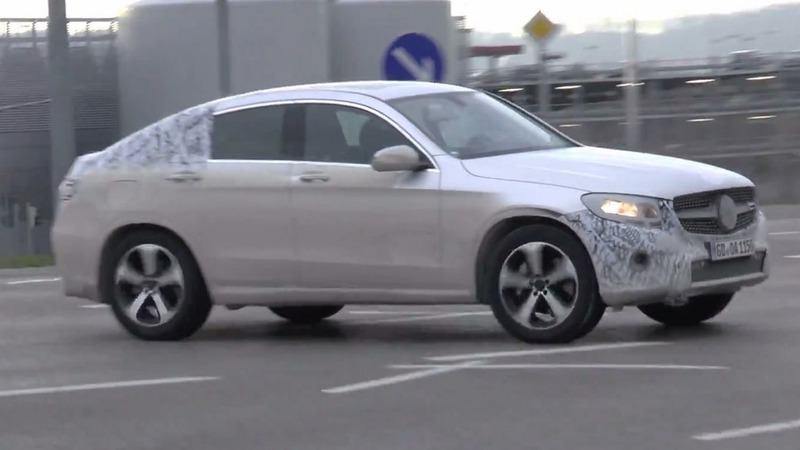 Latest spy video shows Mercedes-Benz is putting the finishing touches on its first ever GLC Coupe. Already confirmed for a 2016 launch, the premium crossover coupe will be Mercedes-Benz’s belated answer to the BMW X4. Now, we have managed to find out for sure the model will also be offered with a plug-in hybrid arrangement as denoted by the second fuel cap on this dusty near-production prototype. We’ve been going through the design several times, so there is no point in detailing once again what will change compared to the second generation GLC (formerly known as GLK). Instead, we will focus on talking about the hardware setup which will be essentially carried over from the C 350e. As a consequence, it will team up a 2.0-liter turbocharged gasoline engine with an electric motor, a seven-speed automatic transmission, and a 6.2 kWh lithium-ion battery. The conventional engine is capable of generating 211 PS (155 kW) at 5,500 rpm and 350 Nm (258 lb-ft) between 1,200 rpm and 4,000 rpm. As for the electric motor, it’s good enough for 82 PS (60 kW) at 2,000 rpm and 340 Nm (251 lb-ft) available right away. This will give the GLC 350e Coupe a combined output of 279 PS (205 kW) and 600 Nm (443 kW), which in the C 350e is enough hybrid punch for a 0-62 mph (0-100 km/h) run in 5.9 seconds and a 155 mph (250 km/h). However, the plug-in hybrid crossover coupe will be a tad slower due to its increased curb weight commanded by the bulkier body style. Mercedes-Benz already confirmed the GLC Coupe will be introduced in 2016, so we will likely see it at the Geneva Motor Show in March alongside this alternatively-powered derivative.